I can’t remember who it was who first told me about Glenorie Bakery, or if I read about it in an article. Somehow though, I had in my mind that I had to visit Glenorie Bakery up north to try their award-winning pies. So when my friend Sarojini suggested a catchup, I invited her and her mother-in-law (visiting from India) to go to the Glenorie Markets and Glenorie Bakery with me. I love a good local market, and Glenorie’s monthly markets have a bit of everything, from local farmers and beekeepers, to old grannies making jams and preserves, younger folk making desserts and organic treats to alpaca farmers selling balls of alpaca wool. The mix of traders really reflects the local area – Glenorie’s a slightly alternative, organic, salt-of-the-earth type of a community. I bought a bag of produce from the organic growers stall, some interesting fudge (musk and salted caramel!) from another stall, and some home-made jam as well. Nothing quite like supporting the local community and small growers! Given that the market is only small, it wasn’t long until we’d completed our shopping and made our way across the road to the Glenorie Bakery. Apparently the bakery has recently undergone a refurbishment, and I have to say it’s looking spectacular. The baked goods counters take up almost half the store, and the other half is a mishmash of intimate tables for two, long communal tables seating up to 16, and tall wooden barrels and stools for those looking to dine quickly. 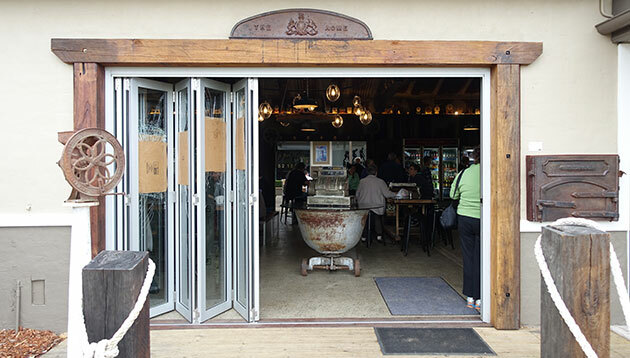 It really caters for all their clientele, from families stopping in for a bite on their way from Sydney to Wisemans Ferry, to local couples stopping in for a coffee, to groups like ours happy to share the communal table with others. The baked goods are what catch your eye first though. There’s two large long glass cabinets – one with sweets, and another with savoury treats like quiches. There’s a separate heated cabinet for their famous pies, and even some freezers in case you want to buy some frozen pies to take home for dinner later in the week. The choice is almost too overwhelming – how do you choose between thirty different little individual desserts, and almost two dozen different pies? We decided to order some hot drinks to enjoy over a leisurely chat before we bought any baked goods. Sitting down at one of the communal tables, we sit, chat, and watch as the crowd slowly changes as the large family breakfast crowd thins out and couples and individuals wander in for a leisurely morning of reading the paper over their breakfast. 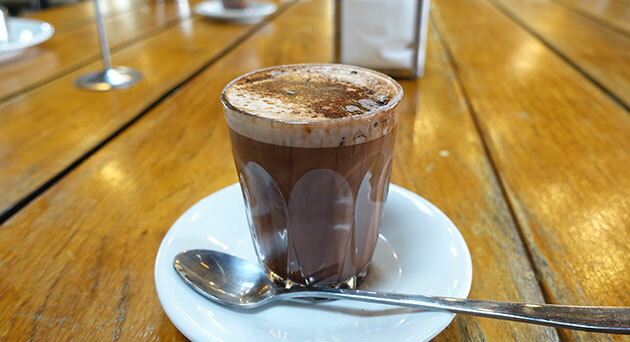 I ordered a hot chocolate to enjoy, a wonderfully rich and creamy dark hot chocolate that wasn’t too milky – just the way I like it. It wasn’t too sweet either, and was the perfect antidote to the cold, rainy and dreary day outside. As we were heading from the bakery to our friend Helen’s house so that Sarojini could meet Helen’s new baby, we bought a few pies, pastries and sweet treats to take with us for lunch. I deliberately over-ordered, knowing that K would want to enjoy whatever leftovers we had! 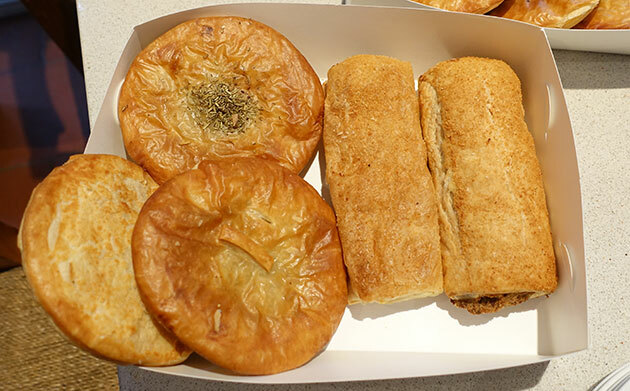 With three of their classic meat pies, three vegetarian pies, two sausage rolls, a chicken and vegetables pie, a lamb and rosemary pie, and a beef and mushroom pie, I definitely got a variety! I got to sample a bit of each one over the next few days when I took the leftovers home, and I have to say that they were all pretty fabulous even when reheated. The vegetarian pie was actually surprisingly my pick of the lot as there was a great mix of vegetables, all subtly spiced with cumin, paprika and other herbs and spices. Given that I have more of a sweet tooth than most people, I also ordered a few small sweets to share. Their mini berry cheesecake was to die for, but my favourite dessert was actually the lamington which was extremely light on the palate and not too sweet. Unfortunately, Glenorie Bakery’s cronuts were a little disappointing – on the smaller side, and not quite crispy enough. I find it really hard to resist buying loaves of delicious crusty sourdough bread especially when its seeded and grained like this loaf from Glenorie Bakery. This loaf was immensely crusty, to the point where it almost hurts you to eat it as the hard edges almost cut up the inside of your mouth. Despite that, I’d definitely buy this loaf again – the flavours were amazing, and it works well either fresh, toasted, or dipped in some piping hot soup! 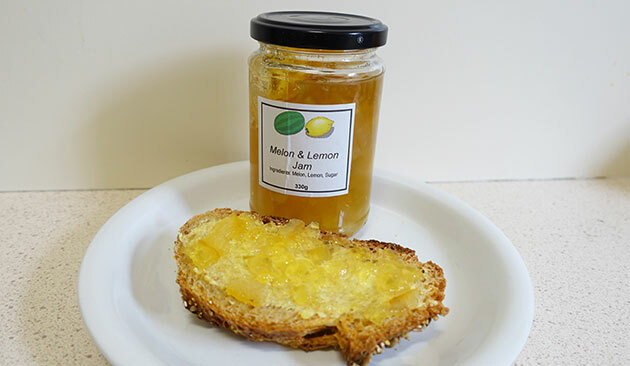 Needless to say, the sourdough bread is just delicious with the home-made melon and lemon jam I bought from the elderly jam-maker at the markets that very morning. A perfect afternoon tea treat! Even though I live in the Northern Suburbs, Glenorie is still a bit too far to venture on a regular basis no matter how delicious their pies and pastries. 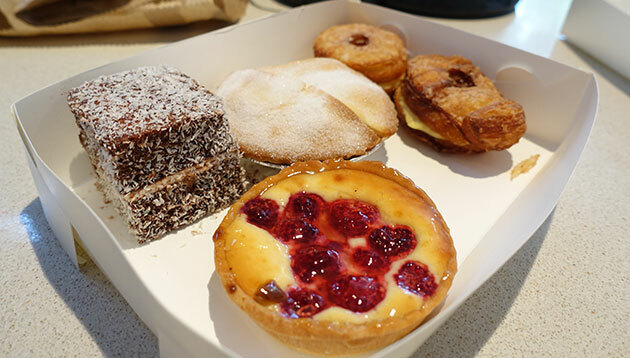 If you’re driving up to the Hawkesbury River for a day trip though, I highly recommend stopping in at Glenorie Bakery for a few delicious baked treats to take with you for your lunch that day…and try to time it so that you get to stop in at the Glenorie Markets as well, on the fourth Sunday of every month! 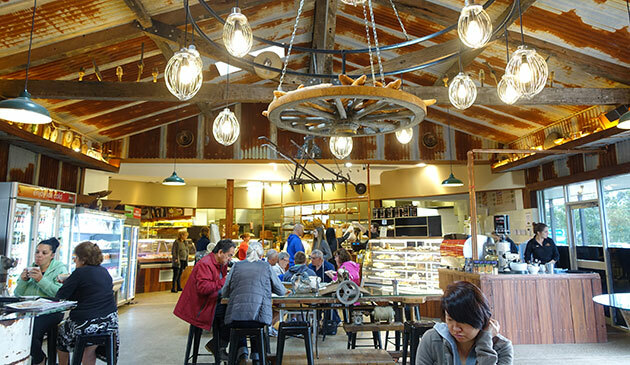 What a quaint little bakery, love the ornamental lights and the horse wagon wheel hanging from the ceiling. I’m a sucker for bakeries!! Will definitely have to remember this as a good pit-stop on the way to the Hawkesbury! 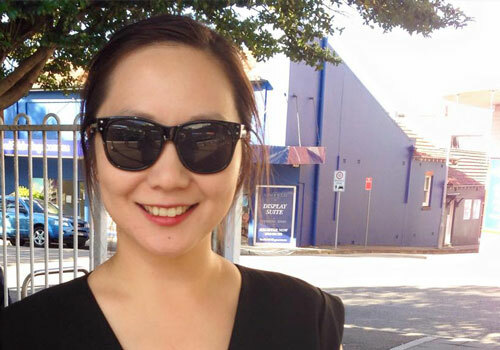 And I’m the same – can never resist a good loaf of bread!